Download the full syllabus here. When student protestors at the University of North Carolina at Chapel Hill toppled a Confederate sculpture in the center of campus, they threw fuel on a fraught hundred and fifty year old argument concerning the meaning of the American Civil War. The statue in question, “Silent Sam,” became the crux of the debate about the removal of Confederate monuments—at stake are questions of history, factuality, and collective memory: Where did all these monuments come from? What were they meant to symbolize, and how has that symbolism changed over time? Who built them, and for whom were they intended? How does one differentiate between American history and American mythology? What should be done with these monuments? The intent of this syllabus is to marshal Silent Sam to the service of teaching history, methodology, and informed political engagement. How do historians establish history, and why are we still debating the Civil War? Are there objective facts about the past that inform the present, or are all facts subject to interpretation and reframing? Silent Sam can be used as a case study for teaching so-called “fake news”—not only how to recognize it as such, but also to see how very real something fake can become when enough people believe it. Silent Sam serves as a model for teaching historical empathy: what does such an object mean to different audiences in the present, as well as past audiences? Are there better ways to engage in political debate than the shallow, Twitter-style discourse that saturates the internet? Finally, Silent Sam serves as an example of civil disobedience, nonviolent intervention, and the wider question of effective political engagement: at what point do, and should, citizens take nonviolent intervention? Following the genre of the Trump Syllabus and the revised Trump Syllabus 2.0 (and 3.0), and the Charlottesville Syllabus, this document is meant to be a crowd-sourced example of how historians and scholars can dynamically respond to emergent controversies, not simply within the narrow context of their respective fields, but also in the classroom, and for the wider public. One goal of this syllabus is to demonstrate the growing role of the humanities in public discourse to address current events rapidly, but also wisely. Another goal is to identify the most relevant materials that are publicly accessible. A study of Confederate monumentality is a study of all monumentality, about what it means to choose to commemorate a particular history. The skills and materials necessary to informed discussion of this topic apply broadly, to nationalism, to myth-making, and to individual self-construction. At the core of this syllabus is the question of why we choose to tell the stories we tell about ourselves. Finally, the Silent Sam Syllabus is intended to be a first draft. And it will always be a draft. Nor does this syllabus claim to be exhaustive. As this controversy unravels in the months and years to come, as it is recontextualized with the next monument that is removed, it will be necessary to update it. We here at Monument Lab welcome submission of additional readings, teaching tools, comments, concerns, or ideas in the spirit of improving this syllabus. If you have any suggested materials to share, please email monumentlab@gmail.com with the subject line "Silent Sam Syllabus Suggestion” or use the hashtag #SilentSamSyllabus. Allison, David B. ed., Controversial Monuments and Memorials: A Guide for Community Leaders, American Association for State and Local History Book Series (Lanham, Maryland: Rowman & Littlefield, 2018). Mostly available online. Cox, Karen L., Dixie’s Daughters: The United Daughters of the Confederacy and the Preservation of Confederate Culture, New Perspectives on the History of the South (Gainesville: University Press of Florida, 2003). James W. Loewen, Lies across America: What Our Historic Sites and Monuments Get Wrong (New York: New Press: Distributed by W.W. Norton, 1999). New Edition January 2019. Savage, Kirk, Standing Soldiers, Kneeling Slaves: Race, War, and Monument in Nineteenth-Century America, New edition. (Princeton; Oxford: Princeton University Press, 1997). New Edition 2018. Also available online through many libraries. UNC Libraries Exhibit on Silent Sam. UNC Libraries Guide to Silent Sam. UNC History Department Statement and Bibliography on Silent Sam. David Blight’s Yale Open Course, The Civil War and Reconstruction Era. Atlanta History Center Confederate Monument Interpretation Guide. AHA: Historians on the Confederate Monument Debate. 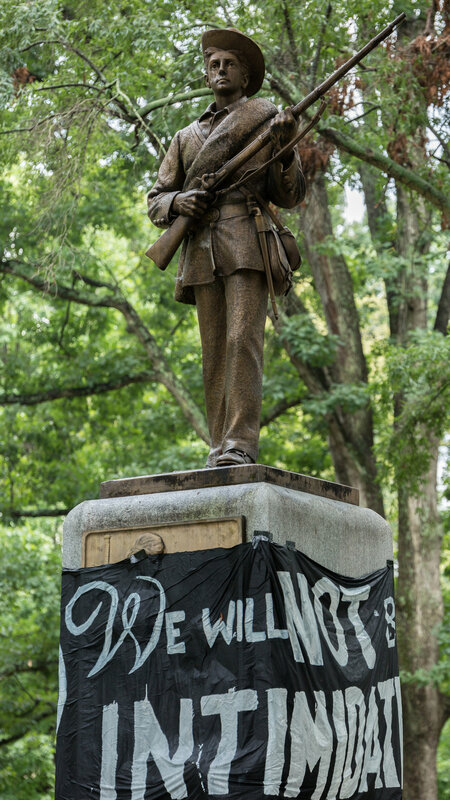 Web Essay: “‘Silent Sam’ The Confederate Monument at the University of North Carolina at Chapel Hill,” by James L. Leloudis and Cecelia Moore. Online. Catalogue Entry: “Confederate Monument, UNC (Chapel Hill),” Documenting the American South, University Library, The University of North Carolina at Chapel Hill. Online. Images: Wikimedia Commons archive. Online. Archive: "Confederate Soldiers' Monument, University of NC, Chapel Hill," in Durwood Barbour Collection of North Carolina Postcards (P077), North Carolina Collection Photographic Archives, Wilson Library, UNC-Chapel Hill. Online. Silent Sam is, but one of many Confederate monuments. Why has this issue come to a boil now? Chapters: “Introduction,” “Slavery’s Memorial,” and “Common Soldiers” in Kirk Savage, Standing Soldiers, Kneeling Slaves: Race, War, and Monument in Nineteenth-Century America, New edition. (Princeton; Oxford: Princeton University Press, 2018). Article: Rebecca Solnit, ‘The Monument Wars’, Harper’s Magazine, January 2017. Online. Map: ‘Whose Heritage?’ Southern Poverty Law Center. Online. Report: Booth Gunter and Jamie Kizzire, “Whose Heritage? : Public Symbols of the Confederacy,” Southern Poverty Law Center, 2016. PDF. Speech: ‘Opinion | Mitch Landrieu’s Speech on the Removal of Confederate Monuments in New Orleans’, The New York Times, 22 December 2017. Text or video. The Civil War ended in 1865. Why was it fought, and what did it mean? Lecture: David W. Blight, "Lecture 27 – Legacies of the Civil War," The Civil War and Reconstruction Era, 1845-1877, (Yale: Open Yale Courses). Online. Article: Jill Lepore, ‘The Age of Facts Is Over’, The New Yorker, 14 March 2016. Online. Chapter: “Journey into the Lost Cause,” and “The Sacred Trust,” in Karen L. Cox, Dixie’s Daughters: The United Daughters of the Confederacy and the Preservation of Confederate Culture, New Perspectives on the History of the South (Gainesville: University Press of Florida, 2003). Who erected Silent Sam? What is at stake with claiming Confederate lineage? Article: Kali Holloway, ‘Time to Expose the Women Still Celebrating the Confederacy’, The Daily Beast, 3 November 2018. Online. Article: Joe Killian, ‘United Daughters of the Confederacy Requested Custody of Silent Sam’, The Progressive Pulse, Dec 27, 2018. Online. Archival Video: ‘What Did the Rebel Yell Sound Like?’ Smithsonian Magazine. Online. Chapters: “The Monument Builders,” Combatting ‘Wicked Falsehoods,” and “Vindication and Reconciliation,” in Karen L. Cox, Dixie’s Daughters: The United Daughters of the Confederacy and the Preservation of Confederate Culture, New Perspectives on the History of the South (Gainesville: University Press of Florida, 2003). Article: Julian Chambliss, ‘Don’t Call Them Memorials,’ Frieze, August 23, 2017. Online. Book: Laura Martin Rose, The Ku Klux Klan: Or, Invisible Empire (New Orleans, LA: L Graham Co, 1914). Online. There has been mountains of reporting on Silent Sam. How and why do liberal and conservative media outlets differ in their rhetoric? Chapters: “Preface” and “Framing 101: How to Take Back Public Discourse,” in George Lakoff, Don’t Think of an Elephant! : Know Your Values and Frame the Debate (White River Junction: Chelsea Green Publishing, 2014). Video: ‘Rachel Campos-Duffy on Confederate Statues’, Fox News, 2017. Online. Interview: ‘Meet Maya Little, UNC Student Whose Protest Ignited the Movement to Topple a Racist Confederate Statue’, Democracy Now! August 22, 2018. Online (two parts). Lester Levine,‘Guest Op-Ed: Silent Sam Speaks’, The Daily Tar Heel, October 28, 2018. Online. How do conventions of masculinity inform the Silent Sam narrative? Why does Julian Carr lean so heavily on classical allusion? Dedication Speech: Julian Carr, “Unveiling of Confederate Monument at University,” June 2, 1913, series 2.2, folder 26, Julian Shakespeare Carr Papers, Southern Historical Collection #00141. Online. Timeline: Silent Sam. (Focus on May 11, 1937). Online. Book Chapters: “Arms and the Manosphere,” “The Angriest Stoics,” and “How to Save Western Civilization,” in Donna Zuckerberg, Not All Dead White Men: Classics and Misogyny in the Digital Age (Cambridge: Harvard University Press, 2018). Confederate monuments not only commemorate, they anticipate—what sort of future do Confederate monuments imagine? Article: Van Wyck Brooks, ‘On Creating a Usable Past’, The Dial, 64 (1918), 337. Online. On Monuments, Place, Time, and Memory, Symposium at Harvard University Graduate School of Design, February 27, 2018. Online. (Start at 15:40). Article: Evander Price – Confederate Future Monumentality (forthcoming on Monument Lab). Who supports Sam? How do they construct their arguments? Article: Jonathan Zimmerman, ‘Historians Should End Silence on Silent Sam’, The Chronicle of Higher Education, 17 December 2018. Online. Article: ‘Empty Pedestals: What Should Be Done with Civic Monuments to the Confederacy and Its Leaders?’ Civil War Times Magazine, October 2017. Online. Article: Evander Price, ‘A Brief Taxonomy of Confederate Monument Apologism’, Monument Lab, Nov 8, 2018. Online. Current Events: Now What Sam? Hundreds of suggestions have been made for what to do about Silent Sam. Are some solutions better or worse, and why? “Report: Data from Faculty Workshops on the Disposition of the Confederate Statue Compiled by the Office of Faculty Governance” October 26, 2018 Format revised on November 2, 2018. Online. “Executive Summary: College of Arts & Sciences Faculty and Staff Survey on Silent Sam.” Online. Steven Johnson, ‘North Carolina Board Rejects Chapel Hill’s Controversial Plan for Silent Sam’, The Chronicle of Higher Education, 14 December 2018. Online. What are the best means for responding to Confederate monuments? Dave Oswald Mitchell and Andrew Boyd, Beautiful Trouble: A Toolbox for Revolution, Pocket edition. (New York: OR Books, 2013). Modupe Labode, "Confederate Monuments and 'The Lost Cause'" in David B. Allison, Controversial Monuments and Memorials: A Guide for Community Leaders, American Association for State and Local History Book Series (Lanham, Maryland: Rowman & Littlefield, 2018). “Part II: From Theory to Action,” in George Lakoff, Don’t Think of an Elephant! : Know Your Values and Frame the Debate (White River Junction: Chelsea Green Publishing, 2014). The following prompts are meant to be flexible starting points for building assignments that can be adapted to the site and circumstances of the course. Identify & Research ~ Find a Confederate monument, or a controversial monument nearby to research, and put into conversation with these readings. Use Loewen’s List of questions for monuments to analyze a monument relevant to you. Imagine & Empathize ~ Write a speech from the perspective of the monument—if the monument were "alive," what would it say to modern audiences? Read & Assess ~ choose two of the articles listed in AHA Monument Debates bibliography, and put them into conversation with one another, and the rest of the course readings. Archival Research ~ UNC Libraries catalogued 50,000+ tweets related to Silent Sam. What can you learn from this archive, and how might one go about using Twitter as a tool in studying history? Evander Price is a Graduate Researcher for Monument Lab. Price is a PhD candidate in American Studies at Harvard University. His dissertation research proposes a new category of monumentality, the “future monument.” The dissertation explores three different monuments spanning the twentieth century, specifically the 1939 World’s Fair, the NASA Voyager Golden Record, and the 10,000 Year Clock of the Long Now Foundation. He hopes to help shape the larger emerging field of time studies and show the many ways that assumptions and metaphors of time tremendously impact how people treat each other and the world around them. The future isn’t what it used to be. The new gatekeepers: Will Google decide how we remember Syria’s civil war?